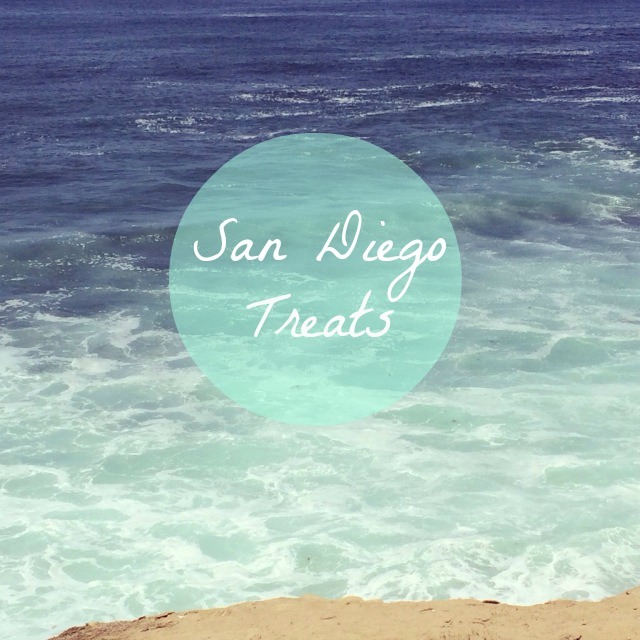 Rob and I went to San Diego last weekend for a wedding, so I did a lot of research and made a list of places to visit since we had never been. Of course my top priority was finding the best restaurants. Although we didn’t have time to try them all, we did have several scrumptious meals! San Diego has a fun culinary scene with a variety of fresh seafood and chic gastropubs. Gaslamp Quarter is full of trendy dining destinations and we also liked Little Italy, which has a bustling farmers’ market. We tend to stay within the $ to $$ range on Yelp, so the below restaurants are pretty affordable, but still delicious! Prepkitchen. I knew this was going to be a great restaurant when I walked in and saw the rustic chic décor. We went on a Saturday afternoon when they were still serving brunch, so I ordered the chilaquiles made with chipotle braised chicken, avocado, onion, queso fresco and over-medium eggs. It had great flavor! My friend ordered the poppy seed pancakes topped with strawberries, rhubarb whipped cream and almond crumble – it was unreal! With the fluffy pancakes and flavorful toppings, she definitely had the best order. They also offer a self-serve coffee and scone bar (pictured above), which I thought was a cute idea. Blue Water Seafood Market & Grill. Rob and I love watching Diners, Drive-Ins and Dives, so we try to visit at least one of those restaurants when we go to a new city. Since we were in San Diego, we also wanted to take advantage of the fresh, local seafood. Blue Water did not disappoint! I loved the mini Calico Amber Ale beer-battered shrimp tacos. The portions are good-sized, too, so you definitely get your money’s worth. Donut Bar. Before heading home we stopped for some sweet treats. 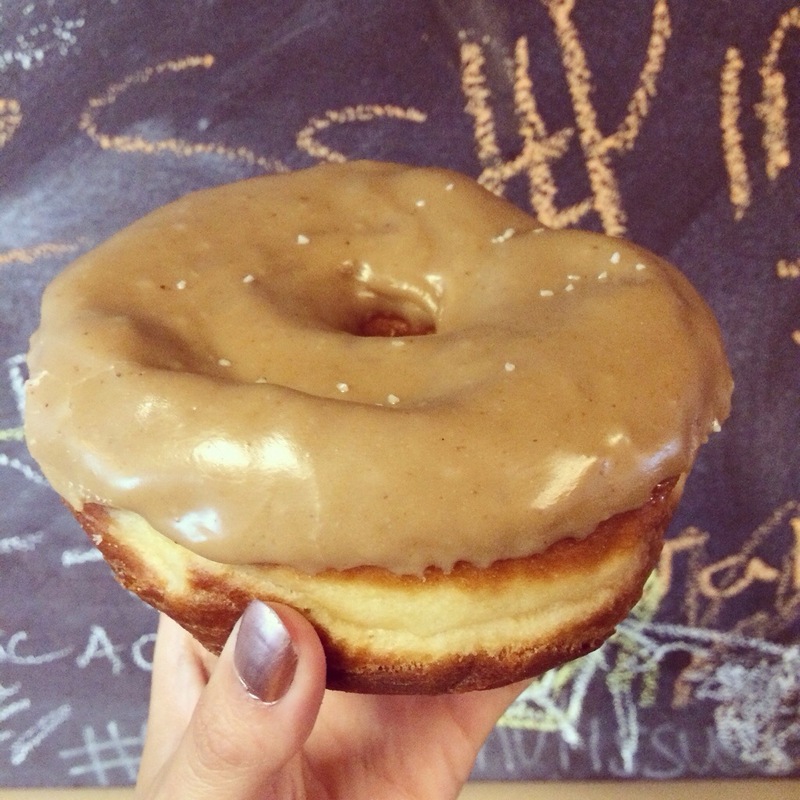 The artisan doughnuts come in a variety of delicious flavors, such as salted caramel (pictured below), Nutella, red velvet and chocolate espresso. These doughnuts are HUGE. I thought they might be a little overpriced when I was looking up the flavors online, but these are at least three times as large as a typical grocery store cake doughnut. We were in a sugar coma on our drive home, but well worth it! El Indio. 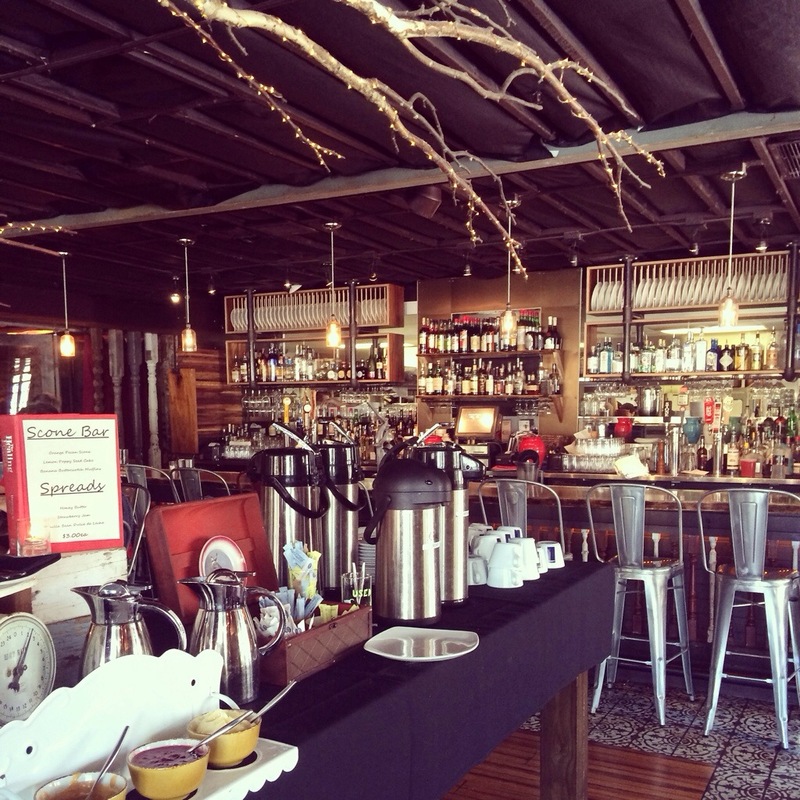 This popular San Diego establishment catered the wedding, which made for a tasty fiesta! We enjoyed the mini chicken burritos, fish tacos and chips topped with guacamole. Next time we will try out the actual restaurant, too! The Fish Market. After touring the USS Midway, we were starving and looking to grab some grub right on the harbor. We came across this waterfront restaurant and had a savory lunch while sitting in the sun. It was pretty crowded, but we found a table on the deck with an amazing view of the water. We loved the baked crab & artichoke dip and king crab BLT. Werewolf. Before heading to the Padres game on the 4th of July we fueled up at this American pub with seared ahi soba noodles and some drinks. It’s a fun atmosphere with a great menu and within walking distance of the stadium. Frost Me. While looking for some waterfront attractions I came across Seaport Village, which is full of shops, restaurants and entertainment. I saw that there was a gourmet cupcake shop that had been a champion on Cupcake Wars, so I immediately added it to our to-do list. Located in the heart of the bustling village, the bakery has a long list of classic and specialty flavors. 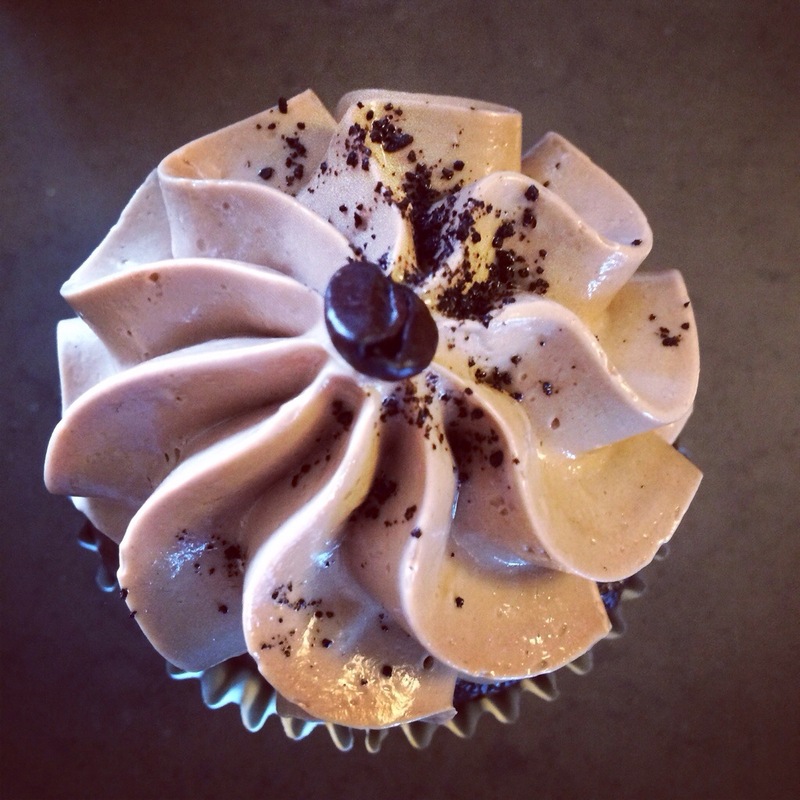 I tried mocha (pictured below), which was made with chocolate cake topped with a layer of chocolate ganache, espresso frosting and crushed espresso beans – delicious! Noble Experiment. This chic speakeasy is hidden inside Neighborhood, a gastropub located in Gaslamp. To get in you have to text a number to make reservation. Luckily, they were able to squeeze the eight of us in last-minute. After you walk through the secret entrance, you’ll find an intimate bar where they specialize in craft cocktails. I didn’t know what I wanted, so I told the bartender I liked wine. He made a delicious drink with fortified wine and strawberries. It was exactly what I wanted without even knowing. Taste and Thirst. This restaurant is divided into a bar and an eating area (hence taste AND thirst). When we stopped by, they were offering a 4th of July special, which was half off of all drinks. We are always down for a cheap drink! It’s a casual atmosphere with a tasty menu – hello, truffle fries! Shiku sushi. Located in the heart of La Jolla, this tasty sushi restaurant has fresh seafood and unique rolls – we loved the soft shell crab. It was the perfect post-kayaking lunch. South Beach Bar & Grille. Great food and great deals! We enjoyed the Taco Tuesday specials – all tacos were $2.75 and much larger than I expected for that price. Great surfside dining! I also research and make a list of places to visit (and eat at). Last year we visited our country’s capital for 5 days and I had a list of about 5 places to eat at. I figure that there are 3 meals a day so that left plenty of options open for exploration and whim. Though we ended up going to our favourite places more than once! On my list are usually places that are unique to that location or that we don’t have an equivalent back home. Since we are eating out so much on holiday I try and avoid the expensive places. I can’t spend hundreds a day just on food. I wish I could! Looks like you got through a good cross section of places. I agree with you when it comes to finding unique dishes that you can’t find at home, that’s why we tried to take advantage of the fresh seafood – hard to find that in the desert!